The importance of a well-maintained fire extinguisher. They are everywhere, in our offices, in our apartment buildings, even in our shopping malls, fire extinguishers are in so many places and for good reason. Fire extinguishers serve to protect us in any sort of fire emergency. They can save millions of lives and save millions of dollars in damages. 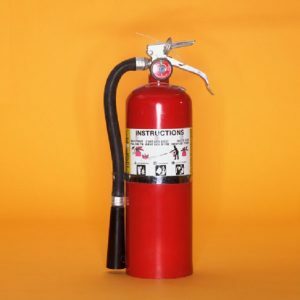 According to the NFPA, most fires only require a fire extinguisher to be used to fight the fire. More often than not a small fire does not require a call to a fire station and instead can be dealt with by using a fire extinguisher. From colleges and universities to elementary schools, fire extinguishers can save millions of lives in a school setting. In all our nations’ school settings fire extinguishers are always our first line of defense. Instead of relying on fire departments, schools are equipped with everything the need to properly and effectively put out a fire. Another common location where small fires can erupt and where fire extinguishers are the best way to extinguish the fire is in hotels. Most hotel fires occur in the kitchen, while the second and third most common reason for a hotel fire are electrical or heating malfunctions respectively. It is easy to see the importance in the reason fire extinguishers can keep hotel guests as well as employees safe. Not to mention the amount saved on potential property damage that can occur from a large-scale fire. Protecting the environment is a big trend these days with the prominence of the go green movement. Turns out, fire extinguishers can help us all be a little greener in terms of protecting our precious mother earth. By controlling fires at their very early stages fire extinguishers help the environment. Fire protections are significant in the release of any greenhouse gasses because they play a critical role in releasing the gasses into the atmosphere. Having the proven ability to fight fires, fire extinguishers ensure that the highest possible amount of fires are contained and make sure that there is the smallest impact on the environment. Fire Extinguisher Inspections with Anderson Fire Protection Inc. This entry was posted on Wednesday, February 1st, 2017 at 4:29 pm. Both comments and pings are currently closed.